Turmeric (Curcuma longa) is arguably the most powerful herb on earth at fighting numerous diseases that plague this world today. For centuries, this ancient root has been used for its medicinal purposes, especially in traditional Chinese and Indian medicine systems. And although turmeric is available in supplement form, I personally love boosting my intake with unique turmeric recipes. Whether it is ground turmeric or whole turmeric root, this aromatic herb just seems to bring something special to food. The problem with turmeric is that people often assume you can only use it in Indian foods. But that couldn’t be any further from the truth! Turmeric makes a great addition to nearly every meal, including drinks, dressings, marinades, and meat dishes. The key component of turmeric’s healing abilities is the chemical compound called curcumin, and there are thousands of peer-reviewed scientific studies rating curcumin’s success. Some of the many health conditions turmeric has been credited with treating include chronic pain and inflammation, rheumatoid arthritis, cancer, depression, diabetes, and brain health and memory. If that wasn’t enough, some research has shown turmeric to work better than various drugs such as painkillers, antidepressants, anti-inflammatories, cholesterol drugs, steroids, and chemotherapy drugs. To help you become versatile with turmeric, I’ve compiled six unique turmeric recipes that you are sure to enjoy. These ideas will help you get this amazing anti-inflammatory herb into your diet nearly every day while helping you fight and prevent several diseases in the process. With so many benefits of turmeric, it’s about time it takes a regular spot in your spice rack, don’t you think? If you’re wondering what to do with this warm and peppery herb, these turmeric recipes will help get you started. Are you looking for a new way to make your food taste amazing? The following recipe can add a powerful kick to any meal, including spiraled zucchini, potato dishes, rice and quinoa pasta, roasted butternut squash, steamed asparagus, or a greens salad. It really is a unique anti-inflammatory dressing that will get most people to eat their veggies. The combination of garlic, ginger, and turmeric is definitely excellent for detoxification, while the hemp hearts are a good source of healthy fats. This recipe makes a half-cup of dressing, and will keep in the refrigerator up to a week. In a blender, combine all of the ingredients, and blend on high speed until smooth. Turmeric tea is popular throughout Asia, and some know it as “liquid gold.” As mentioned, turmeric benefits many inflammatory health conditions. The following recipe is a good way to enjoy turmeric in a rich, sweet, and creamy beverage every day. This recipe serves two, so enjoy with a friend or spouse. Pour coconut milk and water into the saucepan, and warm for two minutes. Add in the ghee, honey, and turmeric powder for another two minutes. Stir and pour into two glasses. 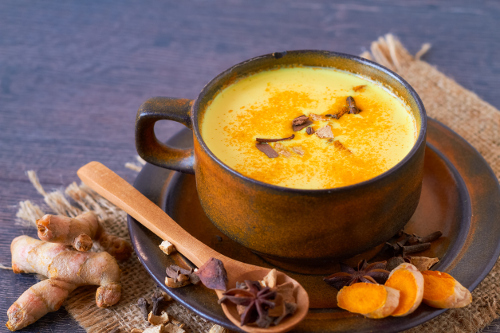 Instead of coffee, try this turmeric-spiced latte to help you stay away from caffeine. Excess caffeine can lead to anxiety, sleep issues, adrenal fatigue or chronic fatigue syndrome, high blood pressure, and especially caffeine addiction. On the bright side, this turmeric-spiced latte contains only good stuff that will benefit your health on many levels. The following recipe makes for two servings, so enjoy with a friend or have both glasses for even more anti-inflammatory action. Place all ingredients together in a blender and blend on high speed until smooth. Serve warm. Serve in two cups, and enjoy with a friend. Another turmeric drink you will surely enjoy is this turmeric juice recipe. Leave the concentrated orange juice in the fridge, and make this turmeric juice instead. The combination of turmeric, hemp seeds, lemon, and honey provides much more than the traditional glass of OJ. There’s anti-inflammatory curcumin, vitamin C, omega-3 fatty acids, and just a little bit of sweetness. What better way to start your day? The recipe makes about one cup, so challenge yourself to make a glass each morning. You likely make use of ground beef, but what about ground turkey? You can use it in most recipes that call for ground beef. Turkey is another great protein source that also contains tryptophan, selenium, phosphorus, and several B vitamins like B3 and B6. When you add turmeric into the mix, you have something pretty special that makes a great addition to lunches or dinners. Add it to avocado toast; combine it with roasted beets, rice, and spinach; enjoy in a lettuce wrap; or serve with eggs or as a side with your favorite vegetables like sweet potatoes or cauliflower. Turmeric turkey is that perfect food prep dish. Make it on Sunday, and enjoy throughout the week. In a skillet over medium heat, add olive oil and turkey, and break the turkey into chunks with a thick metal spatula. Add a quarter cup of broth, salt, cilantro, basil, pepper, cumin, turmeric, chili flakes, and cayenne pepper. Continue to break up the turkey into small pieces, while stirring all the ingredients together. Cook for four minutes, add remaining quarter broth, and cook for another four minutes. Let it sit to cool. Now, it is ready to serve, or transfer to a glass container. I couldn’t make a list of turmeric recipes without including at least one Indian-inspired dish. The following is a dal soup with mung beans and all the usual herbs and spices you would expect, especially cumin, coriander, turmeric, and curry. These spices are said to be great for eliminating negative microbes that affect overall mood and immune health. A dal soup could also make a nice addition to any liver cleanse program. Drink up, and enjoy all the healing benefits of this dal soup recipe. It is perfect for a large group of people and feeds up to six. Bring the broth or water to a boil in a soup pot, and add the mung beans, turmeric, and salt. Lower the heat to medium, cover, and simmer for 35 minutes. After 20 minutes of cooking, skim off the foam with a spoon and cover again. When the beans are cooking, heat the coconut oil in a skillet over medium heat, and add the cumin seeds. As they pop, add the onions and sauté until translucent. Add the garlic, rosemary, coriander, and curry powder, and cook and stir for two minutes. When the beans are cooked, stir in the onion mixture, lemon juice, spinach, and coconut milk. Cook for three to four minutes, or until heated through. Garnish with cilantro and serve immediately. As you can see, plenty of things can be made with ground turmeric and fresh turmeric root. Now that I’ve got you started with some turmeric recipes, I challenge you to include turmeric as a part of your regular diet. It is easier than you think. Turmeric dressing, tea, latte, and juice are easy and quick ways to the golden spice in the diet. Adding it to rice, meat, or Indian dishes is also a good option. The sky is the limit with turmeric-inspired dishes. After all this anti-inflammatory not only provides an aromatic and pleasant flavor, but it may also help fight diseases like cancer, arthritis, diabetes, and Alzheimer’s. Daniluk, J., “Hot Detox: A 21-Day Anti-Inflammatory Program to Heal Your Gut and Cleanse Your Body (Toronto: HarperCollins Publishers Ltd., 2016), 145, 201, 259. Prepon, L., The Stash Plan: Your 21-Day Guide to Shed Weight, Feel Great, and Take Charge of Your Health (New York: Touchstone, 2016), 179. Telpner, M., The UnDiet Cookbook (China: Random House LLC, 2015), 36. Mateljan, G., The World’s Healthiest Foods: Essential Guide for the healthiest way of eating (Seattle: George Mateljan Foundation, 2007), 582, 700.